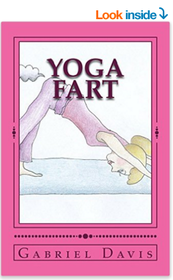 Welcome to Farting Laughing Yogis Yoga or FLY Yoga. To those who may be new to our practice, we hope you’ll keep an open mind. If you haven’t already, be sure to grab a block and a strap. Before we begin today’s practice, I wanted to thank Shelley who has been so gracious to open her Yoga studio to us as a temporary home for FLY Yoga while ours is fumigated. Namaste Shelley. Oh, Shelley has a little announcement she’s like me to read. Uh, thank you Shelley for, um, highlighting for those new to FLY Yoga, that it can be difficult to release some of the things we hold inside. We’re afraid if we allow our troubled southern winds to enter the atmosphere, we will find ourselves rejected for them. But we must learn to accept the dark clouds that dwell within us and release them. We are trumpets, we hold the power to raise our asses in harmony, and sound in a new era where everyone is free to fart. People say it is unladylike to fart. FLY Yoga says, it is inhuman not to. So I say to you today, all who may fart follow me! My sisters and brothers! Fart Loudly, Fart Proudly!